In yesterday's post, I mentioned a number of books I recently purchased. 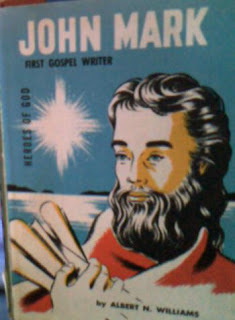 One of those was A. N. Williams's John Mark. You can see the cover of that book to the left. What I find very fascinating about this picture is that in it, Mark is holding a number of scrolls. Not that this cover is (by any means) my starting point for ideas or the "say all, end all" of my views, but it does suggest, however implicitly, that Mark probably didn't write first. At this point, I do not think Mark wrote first and in fact, I would also say that it doesn't really matter who really wrote first. Another thing this photo suggests, and I've been pondering this view a long time, is that just as Luke traveled with Paul as an amanuensis, Mark may have done the same for Peter. But one other thing that this photo illustrates for me is that Mark was probably a traveling author. In fact, as I have argued before, I think Mark traveled around delivering his Gospel account as a type of drama. I think that's one of the reason's for great mixture of Aramaic, Latin, Greek and Hebrew idioms and explanations. Mark was constantly adapting his story/act to his audience. I think the remark, "Let the reader understand" in Mk. 13.14 reveals this too! That statement, I must say, was not written for you and me (the last time I said that, a Church-person looked at me in shock; he thought it had been added in modern translations for emphatic reasons, so that you and I would think harder!). I tend to think that the phrase was a kind of marginal or parenthetic note, added by Mark, for performance / dramatic reasons. It kind of acts as a cue to the reader / performer, making them aware of what's being said / acted. Showing up where it does, in Mk. 13, I would also suggest that it was a type of reminder to the performer that what was being said pertained to the destruction of the Temple. If performers were to pick up on that, instead of taking the story some other direction (and we all know how much that happens w/Mk. 13) the remark would have served to keep the drama in context. And that, in my view and at my present level of understanding, is what the reader is to understand.